There may be times when a one-off special design is required in order to meet particular requirements. 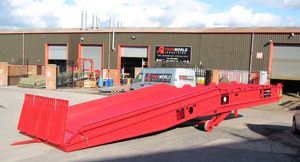 In this situation, it is essential to deal with manufacturers who fully understand what is needed; Thorworld will advise the appropriate solution from a technical, quality, and safety perspective, and we have the capabilities to fulfil the brief. 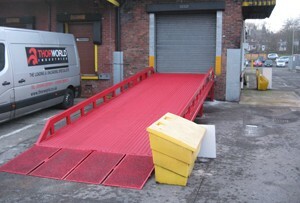 All Thorworld container ramps are designed, tested and manufactured at our factory in Chesterfield, Derbyshire. The skills of our workforce, and use of the latest design software allow us to design, manufacture and install custom / bespoke design products, to suit your specific needs. Bespoke design ramp for movement by hand, allowing pedestrian access to vehicles to manually unload light but cumbersome goods such as furniture. 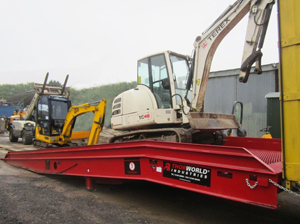 This customer had required a heavy duty ramp, wider than standard to allow loading of wide, tracked equipment. 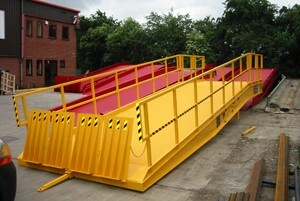 We supplied a modified version of our Super Deluxe ramp to meet their needs. 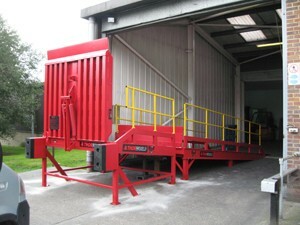 This customer had limited space both inside and outside their warehouse, so our solution (later manufactured and installed) was a fix version of our loading ramp, with a gap in the middle to allow existing roller-shutter door to close through. 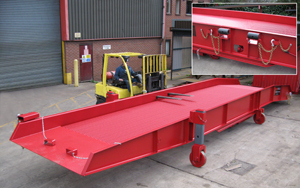 Safe bridging to the vehicle bed height was achieved with the use of a manual counterbalanced dock leveller. 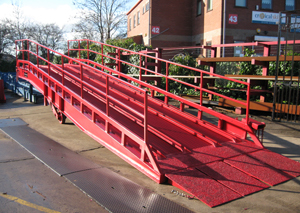 The expanded metal flooring used on our ramps is generally unsuitable for small wheels, but this customer needed to unload roll-cages so the ramp was fitted with handrails and channel guides to aid operator safety, and allow smoother movement of the roll cages. This customer was unloading long pallets/goods from containers. 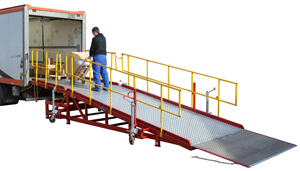 To speed their operation, the 15,000Kg Super Deluxe ramp was modified to have castellated side rails to the top section, allowing goods to be pulled out to the top section of ramp, then lifted from the side by forktruck. This particular customer required safe vehicular access to a raised warehouse flooring, whilst leaving the underside open for emergency access around the building. We later supplied and installed the ramp as drawn. This image shows an alternative use of our mobile ramps that is used by a large number of customers, where access between a raised warehouse floor and outside ground level would otherwise be impossible or impractical. 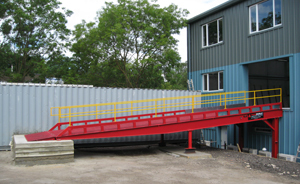 This mobile container ramp was supplied extra-wide to allow movement of wide pallets, and handrails to allow safe pedestrian access for manual hand-balling operations. Contact us today to discuss your specific needs and we will do our very best to help you!